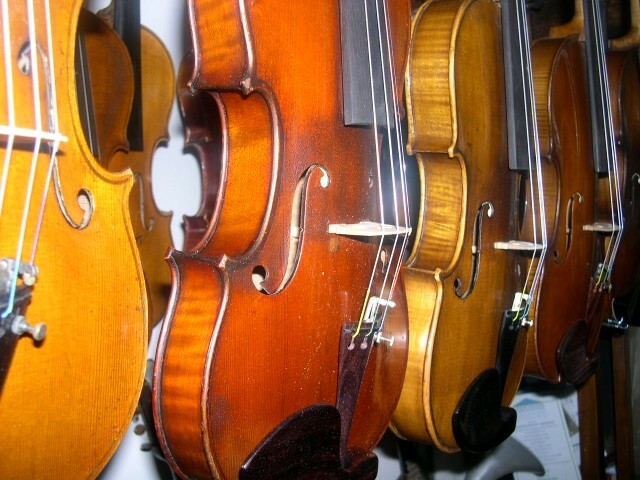 Violiniamati specializes in excellent quality old violins (circa 1850-1930) of outstanding value. At a time when antique musical instruments are very expensive to buy, I can offer quality old violins at very affordable prices. Because they are old, they have been played in and have a mature sound. They are also an investment. Prices range from about 500 euros to 2000 euros. With over thirty three years of experience as a professional violin maker/restorer, all the instruments are in excellent condition, set up to a professional standard and adjusted tonally to the player’s requirements. As a player, I personally try out each instrument individually. I can supply each violin with a brand new rectangular case and a good quality student bow. The cases cost about 35 euros and the bows start at 30 euros. I also have excellent quality cases for about 50 euros and new pernambuco and silver mounted bows are available for under 200 euros. I also have a good selection of old bows. Please contact me for further information.